The terminology "mature naive" and "mature effector" lymphocytes refers to the stage in maturation that the lymphocyte is currently undergoing. Lymphocyte maturation can be split into initial and final maturation. Initial maturation occurs in primary lymphatic organs (eg, bone and thymus) and final maturation occurs in secondary lymphatic organs (eg, lymph nodes). Mature naive lymphocytes are those that have completed their initial maturation, and mature effector lymphocytes are those that have completed their final maturation. Lymphoid progenitor cells in the bone marrow give rise to the most immature form of T cells. From there, these cells reach the thymus and are then termed thymocytes. 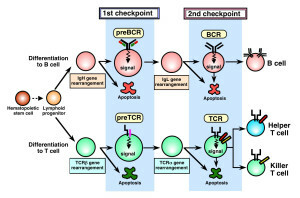 After initial maturation is complete in the thymus, the cells are coined mature naive and the T cells are activated (by antigen presenting cells) to become helper or cytotoxic T cells, at which point they are coined mature effector. 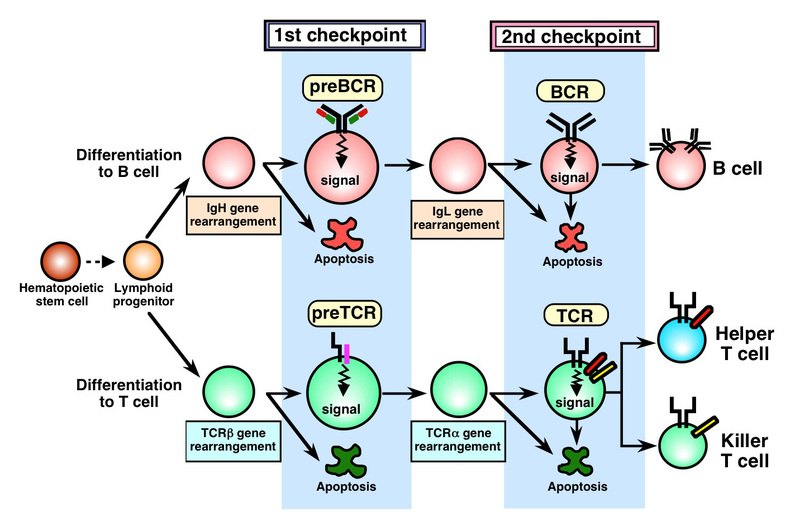 Lymphoid progenitor cells in the bone marrow give rise to the most immature form of B cells. From there, these cells remain in the bone marrow to complete their initial maturation. They are then coined mature naive. Once activated (by antigen presenting cells and T cells), they become mature effector lymphocytes.